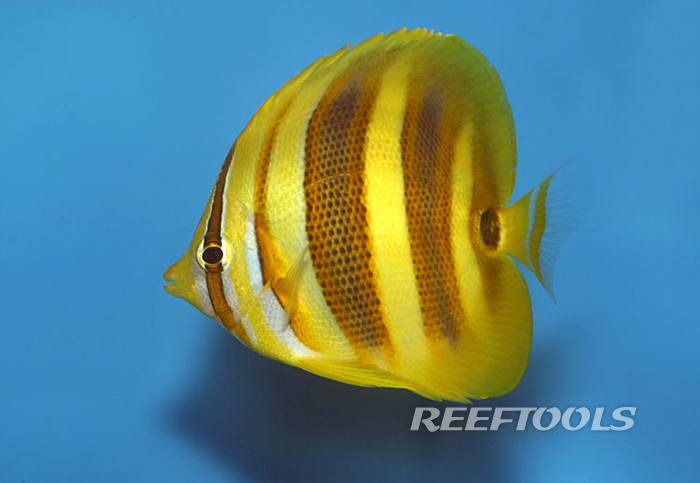 Rainford’s Butterflyfish, Chaetodon rainfordi, is a beautiful sunshine yellow color with rust orange vertical stripes. Juveniles have more white between body stripes and a black occeli on the caudal peduncle. It is native to the Australian Great Barrier Reef, Papua New Guinea, and Lord Howe Island where it lives in shallow waters up to 49 feet deep. This species is difficult to keep in captivity and should only be attempted by the expert aquarist who has experience with obligate corallivores. In the wild this fish feeds on corals and filamentous algae and therefore is not suitable for a reef aquarium. Providing a newly acquired specimen with live coral frags and live algae may help it survive while being acclimated to prepared and frozen foods. Like other butterflies, small specimens adapt to aquarium life more readily than large adults. A seasoned aquarium of at least 50 gallons with large amounts of filamentous algae and live rock is required to house a single Rainford’s Butterflyfish. These fish are very territorial, but may be kept in mated pairs or small groups if introduced simultaneously to a very large aquarium.